How to test request body examples on my Azure API operation? 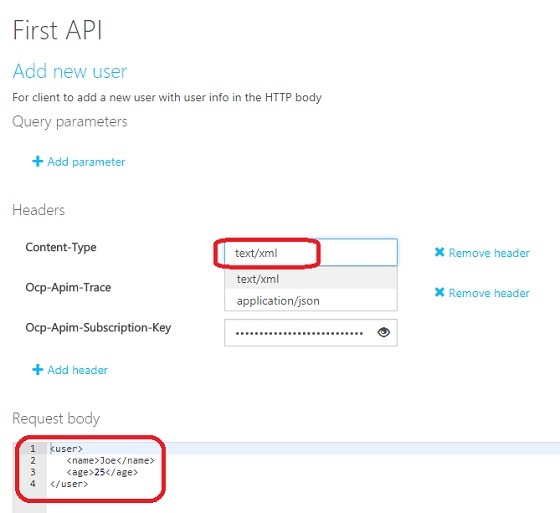 If you have added some request body examples to your Azure API operation, you can follow this tutorial to test them. 1. Go to the developer portal as a publisher administrator. 2. Open the "First API" and open the operation "Add new user". 3. Click the "Try it" button. You see the "Content-Type" header is listed. 4. Click the input field of "Content-Type". You see two options: text/xml and application/json. 5. Select "text/xml". You see the "Request body" box is populated with your XML example. 6. Scroll down, review the request, and click the "Send" button. You see test result displayed.